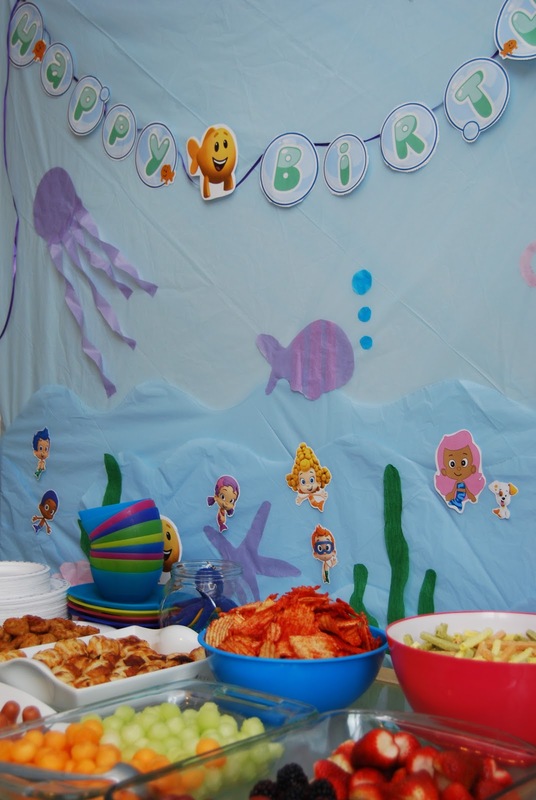 Under the Sea Birthday Party!!! It's that time of the year again when most of my family's birthdays are celebrated. To begin with, our princess who is turning 4. When I asked her what kind of birthday she wanted (a dangerous question!) she thought and said "Ariel". Me being the stubborn mom who does not want to give her a full blown princess party, thought about it and then talked with my daughter and decided it'd be much more fun if we had sea creatures (after all that is where mermaids live right?) at the party. I simply used evites and found a "Under the Sea" Party invite. I basically combined different shows: "The Little Mermaid", "Finding Nemo", "The Octonauts", and "Bubble Guppies"
This is where I overdo it sometimes. 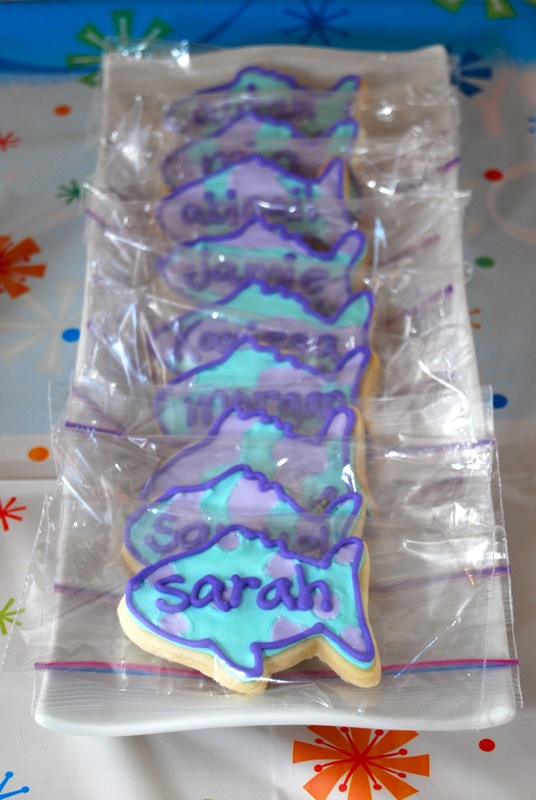 I love doing these crafty things. Aside from the theme I nailed the key theme colours to Purple and Blues. That helped decide anything from decor to cake! Pom Poms - My cousin did these. Here is a sample of the instructions - there are tons online. Basically, just get the tissue paper from the dollar store and start folding and cutting! Clues: - I incorporated several games into the clues. That is, they got the clue, had to complete the task/game together, and then get their next clue. The Treasure is missing! If you want to find it, follow the clues; they'll lead you to more. To find your next clue, look by the front door. It's a clue that you want, a clue you expect,so look by the steps that lead to the deck. Go as fast as you can; there's no time to slouch!You'll find your next clue by the living room couch. It's a clue that you want, a clue that you seek;take a picture with the Bubble Guppies and take a peek. Seek and search; peek and snoop. Throw 3 balls through the fishketball hoop. The next clue is simple; it's not hard at all. Look near the bench in the front hall. A clue, a clue, now where can one be? I think there's one hidden near the TV. You've found lots of clues; now find some more. Start by looking by the washroom door. little fishing clue will be! It's in the kitchen; you use it to chat; Look on the counter; it's as easy as that! You've reached the last clue; it's the treasure you deserve. You'll find the box where little ones are served! Fishketball - Bubble Guppies version of Basketball. I went to my basement and looked for cardboard to use. Lo and behold I found a box where pots and pans were held, all the wholes already cut out. All I had to do is bring out the paint and get my kids to paint!!! I printed fish from the Nick Jr site and glued them around the circles. Once dried, turn it around, and use packing tape to tape garbage bags around the hoops so that when the kids throw the balls you won’t have to pick up from everywhere in the room. I used clean garbage bags I had. For balls, I simply used plastic balls I already had but you could also make bean bags. I think this was the favorite game of the day! Picture Frame - I downloaded a picture frame from the nick jr. site, and had the kids line up to take pictures - this way I ensured I had a pic for each kid. Fishing - I used out sandbox to do this. 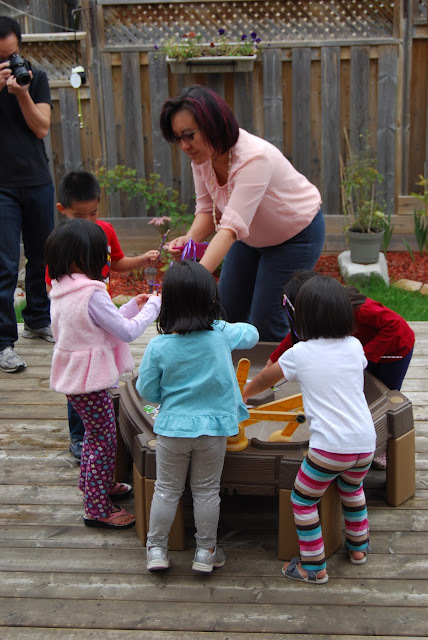 Since at this point the kids were outside in the deck already for fishketball and pictures, we also did this outside. I printed pictures of fish, and then used packing tape and taped on top to ‘laminate’ it in case I was going to fill the sand box with water. Place a paper clip on each. For the rods, I bought a bag of wood sticks from Dollarama, used cheap purple ribbons to ‘up’ its look and attached magnets. Sorry I don't have pics of the fish or the sticks! Undoubtably when they saw these things instead of toys they asked ‘what is this?’ - which led to a 5 min talk (listening time now!) about where is Niger, where do these clothes come from and why we should share and help these girls. To read more about this part click here! Here are some songs I did not get to use but researched on. Happy Singing! Hook it on your line. This one will be mine! Down by the old seashore. Dolphin, Dolphin, wild and free. Swimming, swimming in the sea. Just as free as you can be. Swimming, swimming wild and free. The jellyfish in the sea go "bloop bloop bloop"
Hubby made most of the things. 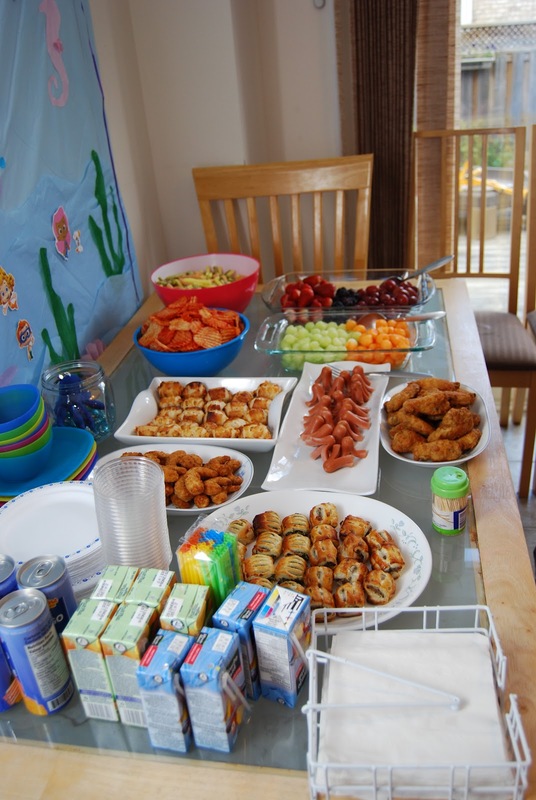 We had typical party food like chicken wings and fruit salad, but we experimented with octopus-dogs, sea shell pasta, and mini medallion burger-shells. There are tons of ideas on www.pinterest.com. The issue is always whether one has enough time to execute everything! I even had blue gatorate ready but never had time to properly serve them as sea water! Because half of the guests came late, we ended up doing this in separate groups. The kids made sea shell and sand pencil holders. And to finish off the celebrations, as it has become tradition in our family, I made a slide show of the year that was for my birthday girl. I used a water sea theme song as background (in later years looking back it will remind you of the party theme you used). I usually just use my computer’s program to do this so it is super easy - it’s just a matter of narrowing down the key pictures and asking the computer to do the rest! What a wonderful summary of such a memorable party! Mmmmmmm a seashell pasta salad. really like that slideshow idea. And the cake looks so beautifuL!